Leaving the Oozells Street Loop at Ladywood Junction. 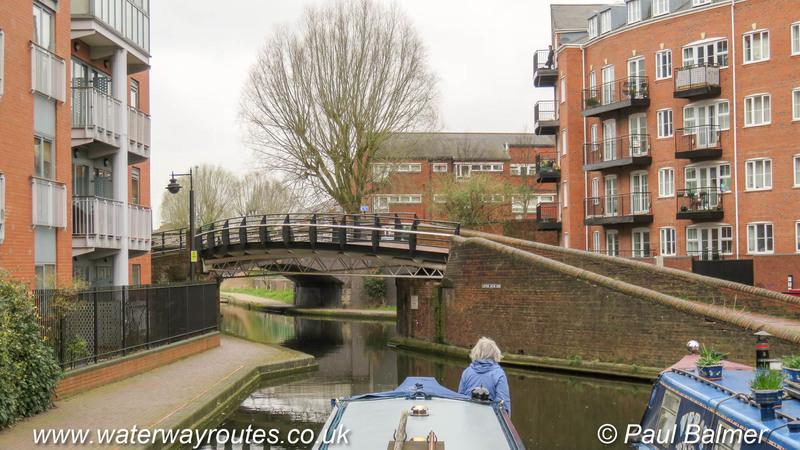 Our Waterway Routes narrowboat is about the leave Sherborne Wharf Marina on the Oozells Street Loop of the Birmingham Canal Navigations (BCN). Under the bridge is Ladywood Junction where the Oozells Street Loop meets the Birmingham Canal Navigations (BCN) Main Line. Wolverhampton is almost straight ahead at this shallow angle junction. Only very short boats can make the sharp right hand turn onto the Main Line towards Old Turn Junction. Longer boats must continue straight ahead, towards Wolverhampton, for around 400m (¼ mile) until they can wind in the entrance to an old basin on the right, before returning towards Ladywood Junction and continuing straight on to reach Old Turn Junction.